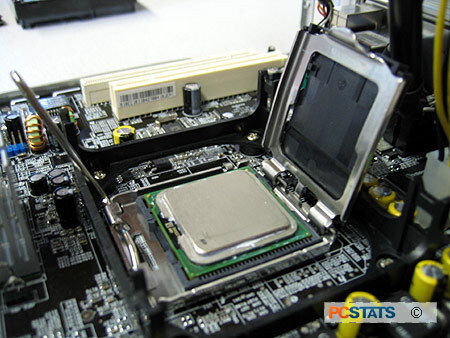 Holding the processor by its sides, orient it so that the two socket extensions will fit into the two notches on the processor. 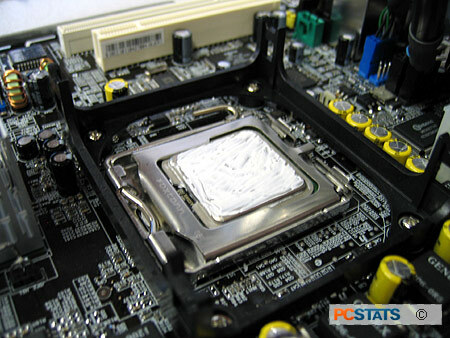 Lower the processor gently and vertically down into the socket, ensuring that it is lowered straight and sits evenly. There are two gaps in the plastic wall of the socket that provide space for your fingers as you lower the chip, so use them. 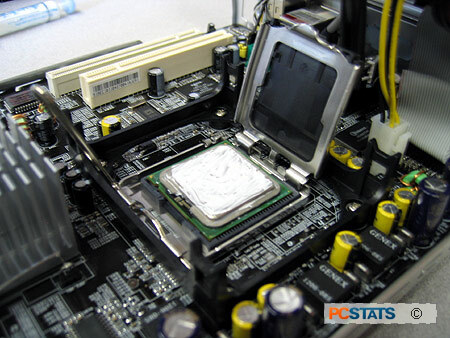 Once the chip is correctly seated in its socket, apply a small blob of thermal paste to the middle of the processor and spread it out with the edge of a credit card or other flat tool so that it forms an even, thin layer on the surface of the chip. Now remove the protective plastic cover and close the metal load plate. It will not close completely, as you can see below. Press one finger down gently on the load plate where it is not completely closed, then rotate the metal lever down towards the closed position with your other hand. Push it down and away from the socket until you can fit it under its retention clip. Securing the lever under the retention clip will fasten the load plate correctly and should cause the plastic protective cover to come loose if you haven't already removed it. If the plastic cover does not come loose, you can safely remove it now by prising it away from the load plate with your finger. In either case, remove and save the plastic protective cover for later. 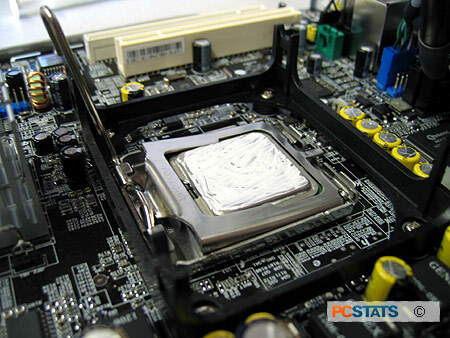 The processor is now properly installed and ready for the heatsink to be seated.